Bing has increased Microsoft’s share of the search market by 1% in the US according to analysis for June conducted by StatCounter. Google, obviously, still dominates the US search market. Microsoft (Bing, Live Search and MSN Search in total) had 8.23% market share in June, behind Yahoo! at 11.04% according to monthly analysis by StatCounter Global Stats. Google has fallen back slightly from 79.07% in April to 78.48% in June but maintains its strong foothold on the lead. Nothing to worry for Serge and Larry. Data is based on an analysis of 1.316 billion search engine referring clicks (336 million from the US) which were collected from the StatCounter network of over three million websites. The fate of the nation’s traditional news sources, specifically newspapers and TV news programs, may lie in the hands, eyes and pocketbooks of America’s well-connected, growing network of women age 50-plus. A recent survey by VibrantNation.com among its more than 20,000 members, shows that while Boomer women are now utilizing the Internet as their core news source they remain heavy consumers of “traditional” media outlets with nearly 70% of respondents citing a combination of newspapers, TV, radio and magazines among their primary sources of news. VibrantNation.com is the first online destination created exclusively for women 50+ and a peer-to-peer information exchange populated by smart and passionate women. â€¢ Online News Leads the Way: 28% of women 50+ depend on the Internet as their primary news source. Of those who turn to the Web for news, 29% use their Web service homepage (Google, Yahoo, MSN, etc. ), 25% log-on to newspaper websites (NYTimes.com, WSJ.com, local newspaper sites, etc. ), 25% read news blogs and specialty online news sources (HuffingtonPost.com, Politico.com, DrudgeReport.com, Weather.com, etc. ), and 16% rely on online news sites of broadcast media outlets (CNN.com, ABCNews.com, CBSNews.com, etc.). â€¢ “Traditional” Media Still Plays a Central Role: While garnering smaller percentages than the Web on an individual basis, when combined 70% of respondents cite multiple “traditional” print and broadcast media as their primary news source — TV news programs (23%), newspapers (21%), radio (15%) and magazines (11%). New data from Knowledge Networks‘ ongoing, single-source measurement of eight key media shows that 11% of the U.S. population now accesses mobile Internet or video weekly, and that these “early triers” are avid users of new and traditional media alike. They spend 30% more time with media than the general population (ages 12 to 64), and they also have higher incomes, travel on business regularly, and are more likely to have made an online purchase. This marks the first time that mobile media has been included in the measurement for MultiMedia Mentor(R), which tracks use of eight media throughout the year – including simultaneous use and detailed profiles of respondent shopping, dining, and other characteristics. The service includes proprietary software (Media Scan; Media Mentor) that enables users to access the multiyear database and determine the most efficient ways to reach key targets with media plans. The study shows that past-week users of mobile Internet or video spend 12% more time a day with TV than the general population – but its share of their total media time is lower (46% for mobile media users compared to 53% for gen-pop). The mobile media group also devotes 75% more time to Internet, which accounts for 26% of their media time (versus 20% for the full population). Mobile Internet/video users also spend more time with videogames than they do with newspapers and magazines combined. According toThe NPD Group, an aggressive â€œbuy-one-get-oneâ€ promotion by Verizon Wireless helped RIMâ€™s BlackBerry Curve move past Appleâ€™s iPhone to become the best-selling consumer smartphone in the U.S. in the first quarter of 2009. 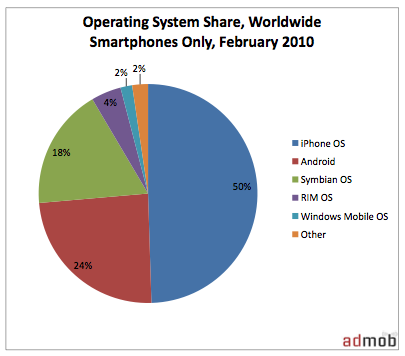 RIMâ€™s consumer smartphone market share increased 15 percent to nearly 50 percent of the smartphone market in Q1 2009 versus the prior quarter, as Appleâ€™s and Palmâ€™s share both declined 10 percent each. 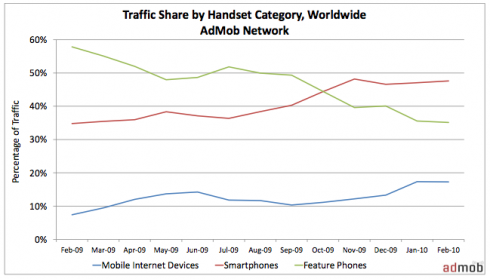 Smartphones, which represented just 17 percent of handset sales volume in Q1 2008, now make up 23 percent of sales.